Finally, Nintendo Switch owners have a chance to play both Fallen Legion: Sins of an Empire and Fallen Legion: Flames of Rebellion all in one compilation. Rather than releasing both games separately, NIS America has bundled both titles with developer YummyYummyTummy’s Fallen Legion: Rise to Glory. These titles tasks you with making on the fly decisions for the entirety of an empire and ties it all together with a wholly unique real-time battle system that’s equal parts demanding and rewarding. Right at the beginning of Fallen Legion: Rise to Glory you’re given the option of two different paths. The first, Flames of Rebellion has you play as Leandur, a tactician trying to get his home back; and the second, Sins of an Empire, is where you play as Princess Cecille who inherits an empire and also inherits a talking book. By playing as both of these different and taking part of their different paths and stories, you’ll be able to get a different point of view as to what is actually going on. Thankfully, Fallen Legion does not drown you in the story dialogue and carefully balances the amount of hands-on time with the combat system and hands-off time with the story. The way Fallen Legion goes about telling its story is really enjoyable and shows that this world has great amount of lore and history. This war wasn’t the first over this now broken empire, even though there’s a sense that it might be the last. Reports stream in of the actions of minor factions and aspiring politicians. My first play through was with the campaign of the well kept and confident Legatus Leandur. Reluctantly recruited into a campaign for the throne by his brother and a devoted subordinate, the stress of war unwinds both his morality and confidence. The mistrust he feels for his allies eventually impacts his relationship with them and turns what looked like a strong leadership into a struggle just to survive. Regardless, it doesn’t matter which campaign you start off with first as the knowledge you gain from one will be equally rewarding to see an alternative take on the situation with another. Both of the main characters will need to be making on the fly decisions during the combat areas that will have you making important choices for your empire that can alter the entirety of how your story plays out, along with providing you a vast array of buffs that will improve your team for that level. Do you choose to please your people by executing a war criminal or do you really need that defense boost the criminal can provide you by sparing his life. These decisions will decide which routes in the story you will take, what allies will be added to your team, and which enemies you create. These are all tied to a morale system that dictates how much heath your team regenerate each time one of these decisions are made. This makes a nice bonus for leaders making smart decisions for their people, but not wholly detrimental for those who don’t. Outside of the two main characters you also have Exemplars. These Exemplars are fallen heroes that you summon to fight for you throughout the story with each one having its own kind of history. In battle, you will be selecting up to three such units and leading them into a series of fights. The would-be emperor and their colleagues run through a hall, stopping intermittently to either clash with a group of foes or to answer a moral question. The combat and fighting in Fallen Legion is one of my favorite parts, which is good because you will be doing a lot of fighting over the course of the adventure. For the controls, your main character is tethered to the X button and d-pad, and this allows them to perform such tasks of healing, attacking, or bringing a fallen Exemplars back to life. The Exemplars, on the other hand, are controlled through the Y, B and A buttons, and when hitting one of those buttons will trigger a specific attack for that character. At first glance, the combat system might look like something you’ve seen before where you take turns launching your team at the enemy and then wait to take the brunt of the enemy’s attacks on the next turn. However, Fallen Legion does the unexpected and makes the battles 100% real-time. This real-time combat system will keep you fully occupied while needing to be very quick to keep track of five main components during battle: your heroes available AP and unleashing your attacks to combo them together efficiently, your enemies attack animations in order to time your perfect block, the combo bar at the bottom shows various buffs and super attacks you can unleash, your three heroes overall health bars, lastly your main characters three spells which can heal, do damage, or revive teammates. Each Exemplar has three attack points, which allow you to do three consecutive hits before waiting for a charge to come back. You can freely switch the positioning of your characters and this allows you to do many more different attacks or abilities with different fight styles. The Exemplars can also block and blocking is a huge part of this title. Being able to block at the right moment can mean the difference between your whole party dying or you succeeding against an enemy. If you hit the black button before the attack hits you. When you achieve that perfect block it will weaken or hurt the enemy and allow you to get much more damage in. One problem I found with the combat was that there were so many characters that could be on the screen at the same time and this would overlap and not allow you to see what the character is doing behind the character in front of you. This makes it very difficult to block an enemies attack if your characters are constantly changing direction, of who’s in front and who’s not. The art direction in Fallen Legion is fantastic and looks just like it’s something right out of similar titles in Vanilla Wares stellar catalogue of games. I was immediately drawn to Odin Sphere and the graphics pop with the same type of texture work. You can tell the developers used a lot of vibrant colors and it works really well with dynamic backgrounds and overall simplicity. Musically, I was a big fan of the orchestra-like grandiose moments of the soundtrack. Overall, Fallen Legion: Rise to Glory has a surprisingly deep, but rewarding combat system that can be as simple or complicated as you want. 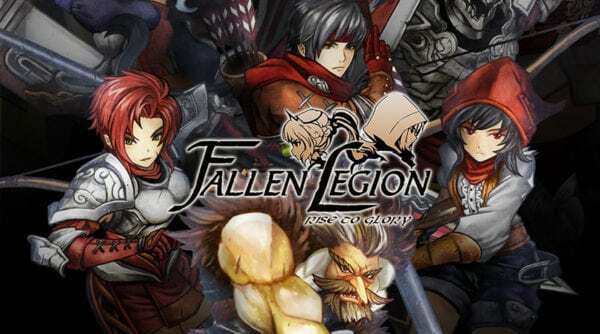 Fallen Legion melds all of its aspects surprisingly well and while the combat screen can be cluttered with overlapping enemies, those who want an RPG that’s entirely unique with its combat system which will test your skills to the max will find that the challenge is quite satisfying. It offers deep tactical action combat that rewards players willing to put in the effort to learn its nuances and is an easy recommendation for the Switch.